As a bush pilot years ago, Imperium Renewables CEO John Plaza made the flight between Anchorage and Tokyo countless times. The massive quantities of fuel it took to make these trips motivated him to enter the biofuel industry. NX Global Inc. has received a $100 million funding commitment from a private U.S.-based organization. The financial support will be used to purchase property and fund construction on a waste-to-energy and algae facility in Canada. 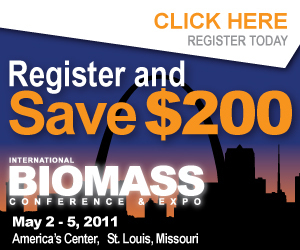 High school seniors in Minnesota have the opportunity to win a $1,000 scholarship by writing an essay on biodiesel. The program, which is in its fifth year, is sponsored by the American Lung Association and the state soybean growers association. Raptor Technology Group Inc. announced Jan. 11 that a company it’s in the process of acquiring, Raptor Fabrication and Equipment Inc., has started up its newest biodiesel plant for Greenwave Biodiesel of Fort Lauderdale, Fla.
A study conducted by the Indian government has determined the price of jatropha-based biodiesel needs to be increased to create an economically sustainable biodiesel industry within the country. The National Biodiesel Board, along with key industry partners from Ford Motor Co. and General Motors, are presenting a Biodiesel Symposium entitled “Biodiesel: Powerful Fuel, Promising Future” at the Detroit auto show on Wed., Jan. 12. 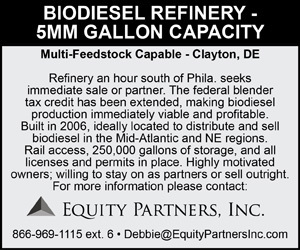 Adamstown, Md.-based Chesapeake Green Fuels LLC has retained Pasadena, Md.-based Equity Partners Inc. to sell its idle biodiesel plant. CGF has been trying to sell the facility, which is located in Clayton, Del., for approximately six months. U.S. interest in light-duty clean diesel vehicles is growing. According to a speech given by Matthias Wissmann, president of VDA, at the NAIAS, the U.S. automotive market for light-duty vehicles is continuing to grow despite the economic downturn.